We were thinking to foster this pup… but l guess we failed… So we are keeping him since he reminds us too much of @pitbullsharky and #sharkcat and #roomba adventures! Our house is happy and full of laughter again! I’m still busy with my 3 year old son and this puppy - they are “partners-in-crime” in my back yard - always up to something!!! Mitch Bergsma visiting Pit Bull Sharky, iRobot Roomba Cat, texasgirly1979. Chicks on dog (duck) + Cat (butterfly) on iRobot Roomba!! HALLOWEEN PARTY!! Amazing Halloween Pets. American Pit Bull Terrier Sharky dressed as a duck. Max-Arthur the iRobot Roomba cat is cute little pink butterfly and the real chicks and being just cute show off. Animals are AWESOME! 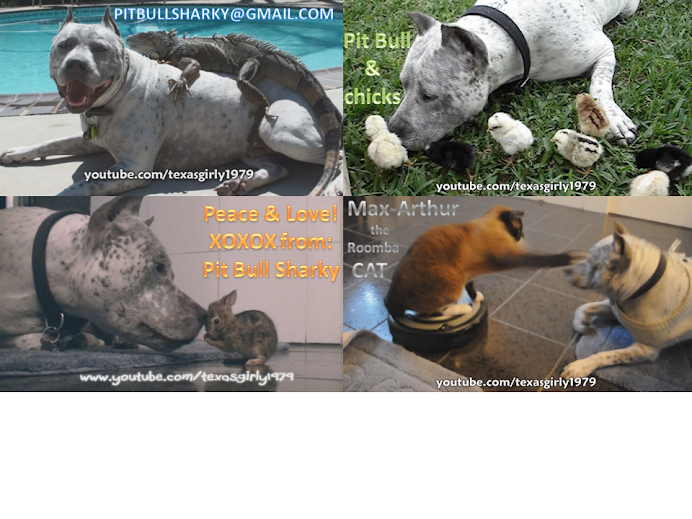 Nov 6th 2011 - We are going to Austin Texas to be a part of this big Texas Sized Pittie Pride Parade!! YAY!! Can't WAIT! !